Food and Fuel America.com: Held Hostage to Foreign Oil? Americans Want Renewable Fuels Now! 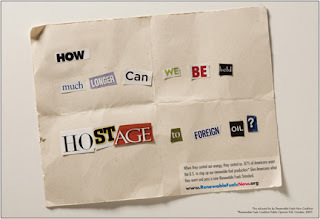 Held Hostage to Foreign Oil? Americans Want Renewable Fuels Now! Nearly three out of four Americans support increased use of American-made renewable fuels according to a new national poll by the Renewable Fuels Now coalition. According to the new national survey, 74 percent of Americans think America should increase the use of renewable fuels like ethanol. In addition, 87 percent of Americans maintain the federal government should actively support the development of a renewable fuels industry in this country, and 77 percent think Congress should encourage oil refiners to blend more ethanol into their gasoline products.